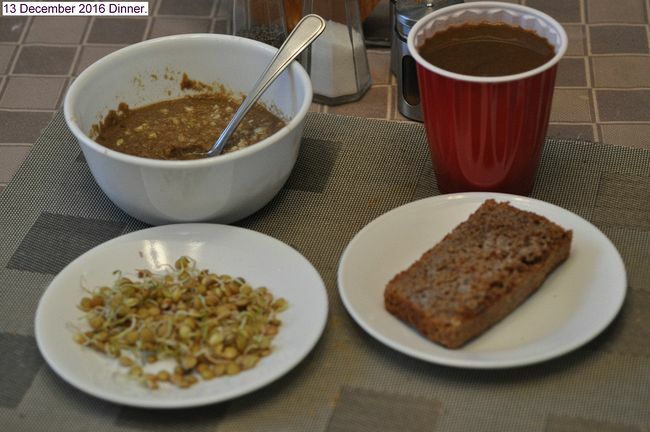 Dinner: Chicken vegetable soup,Slice of whole wheat bread, bulb of garlic, a few sprouted lentils, glass of mixed juice. All home prepared. The garlic was crushed and set side for about 15 minutes for the enzymes to act, then was lightly fried in butter for about a minute to remove the sting. This entry was posted in Uncategorized and tagged 13 December 2016 Dinner, Dinner. Bookmark the permalink.